The Alaskan Klee Kai tend to be a little 'dog aggressive' if not socialized properly. It is truly wise to begin socialization as soon as you get your Alaskan Klee Kai. 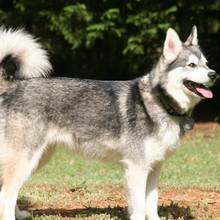 The Alaskan Klee Kai is not recommended for living situations with small animals such as birds, rabbits or gerbils unless they are raised with them. This is due to the strong prey drive that is present in this breed. If they are not socialized well with small animals from a young age, they will have the propensity to hunt and kill them. They are also not recommended for homes with small children. They do not take well to the typical antics of babies and toddlers, such as pinching, poking and pulling and may respond by nipping at the child. The Alaskan Klee Kai tend to be a little 'dog aggressive' if not socialized properly. It is truly wise to begin socialization as soon as you get your Alaskan Klee Kai. The Alaskan Klee Kai is not recommended for living situations with small animals such as birds, rabbits or gerbils unless they are raised with them. This is due to the strong prey drive that is present in this breed. If they are not socialized well with small animals from a young age, they will have the propensity to hunt and kill them. They are also not recommended for homes with small children. They do not take well to the typical antics of babies and toddlers, such as pinching, poking and pulling and may respond by nipping at the child. ﻿The Alaskan Klee Kai is a part of it’s pack. They require a good amount of face time with their owners and would prefer to follow them wherever they go. However, the AKK is cautious and will not immediately warm up to strangers or unfamiliar situations. They do have wonderful watchdog potential, as they are extremely loyal and alert as well as prone to barking. The Alaskan Klee Kai can become a high strung dog without the right level of activity. You can find Alaskan Klee Kai puppies priced from $495 USD to $2900 USD with one of our credible breeders. Browse through our breeder's listings and find your perfect puppy at the perfect price. Alaskan Klee Kai Puppies for Sale - Shipped Worldwide! Finding the right Alaskan Klee Kai puppy can be dog gone hard work. PuppyFind® provides a convenient and efficient means of selecting and purchasing the perfect Alaskan Klee Kai puppy (or Alaskan Klee Kai puppies) from the comfort of your home, 24 hours a day, 7 days a week. Take advantage of our PuppySearch or leisurely browse our directory of hundreds of dog breeds, Alaskan Klee Kai dog breeders, Alaskan Klee Kai dogs for adoption, and Alaskan Klee Kai puppy for sale listings with photos and detailed descriptions. Some Alaskan Klee Kai puppies for sale may be shipped Worldwide and include crate and veterinarian checkup. Many Alaskan Klee Kai dog breeders with puppies for sale also offer a health guarantee. With thousands of Alaskan Klee Kai puppies for sale and hundreds of Alaskan Klee Kai dog breeders, you're sure to find the perfect Alaskan Klee Kai puppy.